I'm combining two companies into this post because each company doesn't have enough to fill a post on their own yet they are interesting enough to discuss, these are true oddball stocks. If people seem to like this format I'll probably continue it as I journey through my 2003 Walkers Manual of Unlisted Stocks. Before I start both of these companies are small (although on different spectrums one $9m, other $1b) unlisted stocks and illiquidity can be a problem. Both companies below are fairly illiquid although Ash Grove Cement is a bit more liquid than OPT Sciences. DO NOT USE A MARKET ORDER WHEN ATTEMPTING TO BUY! I also want to mention that Ash Grove doesn't list their financials online or to the SEC. If you want to get an annual report you need to buy one share, fax the company proof of shareholding and they will mail you a copy of the 2010 report. I would expect the 2011 report to come out sometime in March. I went through this process and it's pretty easy and quick. OPT Sciences manufactures anti-glare coatings for glass and LCDs. Their main customer is the aviation industry who uses the coatings on airplane instrument panels. There isn't much to discuss regarding the actual business, it's pretty straightforward. If the aviation industry is doing well OPT Sciences is doing well and visa versa. All orders are customer made to specification meaning that sales vary quarter to quarter, delivery time is between four to twelve weeks. The big risk with OPT Sciences is that their two largest customers make up 69% of sales. Additionally their delivery timeline is the customer's timeline and not based on their ability to manufacture. The second risk is that 66% of the shares are owned by the Arthur John Kania Trust further limiting the float and any chance for a shareholder to stir up the pot. This is an impressive little company, most of their 2010 and 2011 results are from pent up demand following the 2008 and 2009 downturn. Even if earnings shrink there is still a considerable margin of safety considering the investor is able to purchase for less than liquidation value. The only problem with OPT Sciences is that liquidity is very limited and it doesn't seem that there's any sort of value creation catalyst. The company states they are unlikely to pay a dividend in the future so for now that cash is locked away tight. My guess is that at some point the trust that owns a majority of the shares decides they want a bit of liquidity and the company starts to pay out earnings and possibly cash as a dividend. If I could ever get an order to fill I'd be happy to own a bit of them and sit back and wait. Ash Grove Cement as its name implies is one of the largest portland cement producers in the US. The company has facilities spread across the western US and is headquartered in Kansas City. The cement business is pretty simple, buy aggregate, add sand, crush it and distribute as cement mix or add water and distribute as cement in a truck to a construction site. What got me interested in the company was seeing that they had a ~$200m market cap and over $1b in sales back in 2008. The market cap figure listed was wrong on the site I was looking at but it was too late at that point, I didn't realize this until I got a copy of the annual report. The company had quite a run of sales going from $682m in 2001 to $1.2b in 2007. Sales dropped off from during the financial crisis falling to $872m in 2010 tracking the fall in housing. Cement production is pretty resource intensive with high fixed costs which have really hurt the company the past few years. 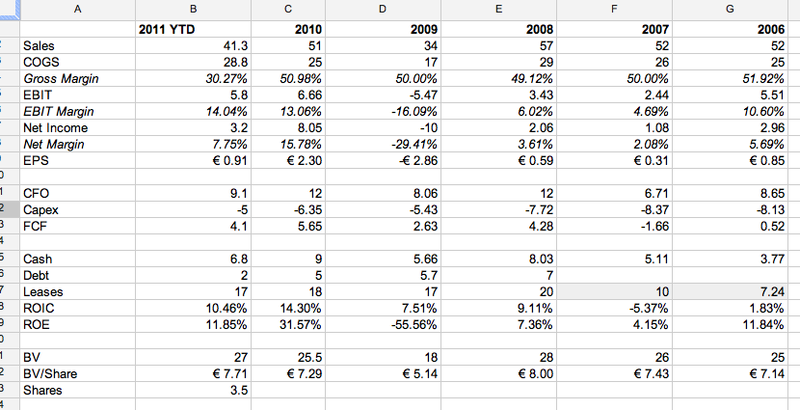 The gross margin in 2009 was 21% and 15.8% in 2010, net margin was 7.9% in 2009 and 4.28% in 2010. In the annual report management warned that they expect conditions to be even worse in 2011. In the winters of 2010 and 2011 the company idled their plants because inventory storage was full and it was unlikely that it would be worked down over the winter. The balance sheet is interesting, the company is selling for far less than book value, the depreciated value of the PP&E is $167.85 a share alone. -1.7% weighted average rate on the long term debt, it seems some of this is due to state sponsored bonds. Ash Grove Cement might be a good investment if the housing market starts to recover or demand for cement picks up. The company has the balance sheet to wait out a long recovery, they've been in business for 130 years and even in this dry stretch have been able to operate profitably. If you're interested in any further information drop me an email. I want to look at another hidden champion in this post. I previously examined Corticeira Amorim in this post, and this post. Hidden champions are companies that are usually market leaders in a niche industry or technology. Hidden champions by their very nature are businesses with moats, often due to a few factors, technological advantages, cultural advantages, and worldwide distribution. It's no accident that hidden champions are the top of their field. Most hidden champions are private companies, only about 9% are publicly listed. Considering the small relative float, and the superior execution level these companies exhibit it's rare to find them selling cheaply. What got me interested is that with the European crisis many hidden champions have seen their prices fall along with the broader market, and I think we might be in a rare period when some of these companies can be picked up at reasonable prices. So now onto the current hidden champion Basler. Basler is an optics company located in Northern Germany near Hamburg. The company makes a variety of different cameras for industrial applications. The cameras Basler sells are focused on three main markets, the industrial segment, traffic segment, and medical segment, the key is that these aren't consumer cameras. The cameras are interesting, they come in all shapes and sizes but the company specializes in small fast ethernet cameras. The cameras only need to be connected to an ethernet cable, the cable can be up to 100m in length. The ethernet powers the camera (Power over Ethernet technology) and also sends the video back to a computer. The cameras are tiny and have some impressive stats. I picked one from the Area Scan category as an example, the camera is 42mm x 29mm x 29mm (1.65in x 1.14in x 1.14in), it can capture color video at a resolution of 1294 x 964 pixels at 30fps and send the video back over Gigabit ethernet. If you're having trouble picturing the size the lens is about the same size as a beer bottle cap. Basler makes both the camera hardware and software to accompany it. Industrial - Cameras in this category can be put on a production line and used as sensors. For example a camera might check a food assembly line for foreign objects in a package. If the camera is applied to the print industry it could be used for quality control, or sorting. Medical - A camera in this category can be used in surgery or highly demanding medical devices. The company mentions microscopy as one use. I had a knee scoped a few years ago and now I'm wondering if a Basler camera was used. Complete random aside, if you're considering a scope I'd highly recommend it, I'm back to running, skiing and biking without any issues or pain. Traffic - Basler cameras can be applied to traffic in three different applications, traffic control, traffic enforcement and tolling. Traffic control is a monitoring application, used by a local transportation department and often shared to local news websites as "traffic cams". Enforcement is the dreaded red light cameras, and tolling is something like EZ-Pass an automated toll system where a device resides in the car and there's no need to stop and pay a toll the driver just passes straight through. At this point it might be appropriate to ask how Basler is a hidden champion. The company is considered a leader in the vision technology field. They were the first to incorporate Gigabit ethernet into their cameras and they're helping to define the USB 3.0 video camera standard. The company has over 50 models of cameras and are considered the highest quality in the field by clients. In addition the company has more than 20 years of experience in their current niche. I would say these things qualify Basler as a hidden champion, a leader in a niche category, a high quality producer, and a culture that has experiencing operating at this level for years. The company had a record year in 2010 where they surpassed the 2007 high water mark for sales. According to the annual report they expect single digit growth in the industrial market and double digit growth in the medical and traffic markets. The company expects to grow at a steady 5% rate for the foreseeable future. 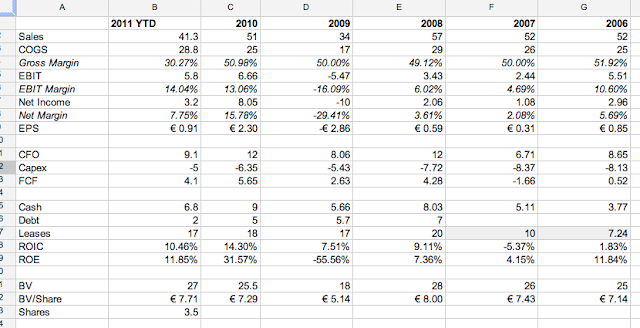 In the first nine months of 2011 revenues are running ahead of 2010 with expected revenue in the €54m range. If the recent margins remain stable the company should have EBIT come in at €8m with net income slightly higher due to tax benefits. It should be noted that Basler has sales offices in the top optics locations worldwide. They also have sales offices in areas where customers are concentrated. When I looked at Basler's current results I was favorably impressed, the company has a nice return on invested capital, and great margins. I wanted to get a historical perspective to see if the company had always operated at this level, or if it's recent. I put together this spreadsheet with some relevant information from the past five years. The first thing that stood out to me was that ROIC and ROE are really only above average recently. Additionally there seems to be a break right around 2009 where something changed dramatically. So I went digging and the answer was found in the 2009 annual report. It seems that Basler was rocked by the financial crisis reporting a sizable loss in 2009. The crisis and dire conditions caused the board and management to re-evaluate the business. Consequently they sold off a lower earning core division and streamlined operations (presumably by firing employees). The result of this was that the company lowered their break even point from €51m to €36.5m. The changes management took in 2009 seem to have been prudent and the right course of action looking back two years later. Sales picked up in the camera business and due to the increased operating leverage earnings received a nice boost and subsequently ROIC and ROE rose as well. 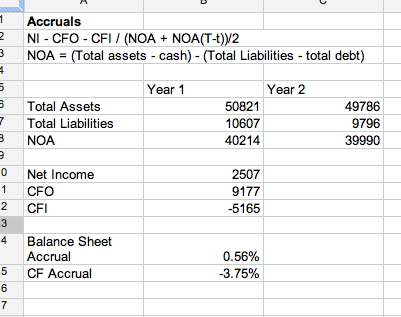 One thing an enterprising reader of my spreadsheet might notice is that I included Basler's leases in my calculations. The company leases all of their facilities, and a substantial portion of their assets are leasehold improvements. I don't like the structure of something like this because the company doesn't own what they've developed. I'm sure it could be argued that all they're leasing is a building space and in theory they could move their equipment and setup somewhere else if they needed to. The problem I have with this is that the company is at the mercy of their lessors. The lessor knows considerable improvements have been made and it gives them leverage to raise the lease price cutting into Basler's results. I'm not privy to the decision making behind this, but it seems that Basler has operated this way as far back as I can find results. The notes mention that Basler has the option of buying out the buildings at the end of the lease. The rate on the lease is 6.34%, I have no idea if this is a competitive rate in Germany, it's slightly higher than their outstanding notes but lower than their bank rate. One last point I want to mention is on the tax front. If you notice the company actually gets a boost to net income in 2010 from a tax refund even though they were profitable. This seemed like a potential red flag but I found buried in the notes that Basler has €17m in a tax loss carry forward that they're working down. I don't know exactly how these work in Germany but I'd estimate they have a year or two of this left. After reading so much about this company I started to feel like I was wearing rose colored glasses. I'm a sucker for their technology it's really cool stuff, and a lot of financial metrics looked great. I needed to step back and evaluate, so I took a look at a few things, the first was earnings quality. Earnings quality is excellent, with a very low amount of accruals, and net income confirmed with solid cash generation. 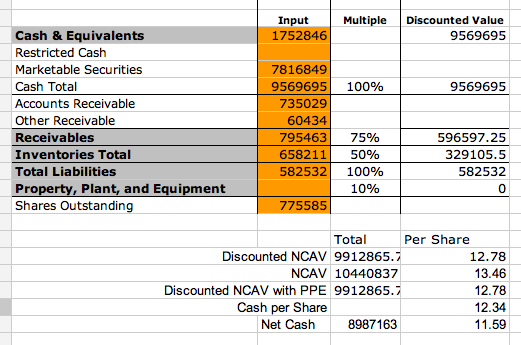 I also looked at cash flow, the company is a consistent cash flow generator. They do have to re-invest a substantial amount back into development but they have continually thrown off free cash flow. The free cash has been used to pay back bank debt and pay dividends among other things. Other red flags or points of queasy-ness did emerge for me. The biggest is that a few people in management have made loans to the company at market rates. I'm not sure why this is necessary but it leaves me uneasy. On the flip side the same people also own significant shareholdings. I just can't imagine a situation where management offers to loan the company from their own personal fortune. I should note these loans do seem to be paid back, but it's a constant revolving door. As one loan is repaid another one is extended. Of course the biggest thing that can go wrong is for Basler's sales to drop off. Basler doesn't have a margin of safety in the traditional sense that I like. Most companies I take a look at have a large slug of assets protecting my downside. Yet at the same time Basler is a great company with a nice moat that no net-net could ever dream of. In a sense the margin of safety is the moat, the competitive position Basler holds in their market. The risk here is that if sales do drop the shares can fall hard, back in 2009 when they reported a loss the market cap was €19m half of what it is today. I'm not sure if the following items are catalysts but I think they're good things that can only help the company. The first is Basler authorized a 10% buyback, so they'll buyback up to 350,000 shares on the open market. This could be a great way to support increased trading volume in the company. The justification for the buyback is fascinating. The board said the shares are at a very low level and they want to buy them when cheap and hold on so at some future point when they're more richly valued they can use them in an acquisition. The bad news in this is that the buyback won't be canceling any shares. I'd prefer a buyback to shrink the piece of the pie I own. The second item is that the company has formally instituted a dividend policy as of last year. They declared that there is a fixed dividend component of €.20 a share and a variable component both together totaling 30% of net income. The dividend paid for last year which should be similar to the amount this year gives the shares a modest 2.5% dividend yield. Past readers of the blog might have noticed that I didn't include a section discussing why the company is cheap. Partially the reason is I'm not sure if they're exactly cheap. On a pure metrics basis of say EV/EBIT they seem cheap sporting a ratio of 4.32. But once you add back in those pesky leases the EV-adj/EBIT bounces up to 6.4x. Another measure of value the P/E ratio stands at 4.6x seems crazy cheap, but if you back out the tax advantage to earnings the stock is at 6.23x which is close to the DAX P/E and reasonable considering the illiquidity. So all things considered Basler is basically trading at a market multiple with the DAX. With some of the metrics behind us I think it's fair to conclude that the stock is attractively priced, but probably not cheap. If I wanted to find a reason this is at €11.27 and not €18 I think it's found squarely in two things, the market cap and associated illiquidity and the fact that it's family owned. This is a €39m company we're talking about that only traded 5500 shares last year. Put another way only 16% of the company traded. This is way too small for many funds to invest in, and even if they wanted to invest the volume isn't there. The second issue is that the company is 51% owned by the founding family. Often family controlled companies scare away institutional money. Strangely enough I find myself researching and investing in a lot of these family companies across Europe. My rational as an individual is that often a controlling family won't do anything that could put their fortune at risk. This often means a company might not run at the optimal level, yet it gives me comfort that my investment is safe. Of course all this presumes that management isn't looting the company from shareholders which doesn't seem to be the case. Salaries are modest and low compared to US standards. The one outstanding question are those loans the officers keep making, I'm not sure what to make of them. I wrote the bulk of this post over two days and as I started I kept thinking that this is a great company I'd love to own, my feelings slowly changed as I wrapped things up. Everything seemed great at first, a reasonable price, great returns and significant earnings momentum. Basler seemed to be a fat pitch a great company at a really good price. But for some reason after I finished researching and typing this post the thought of buying Basler shares just didn't sit well with me. I thought this over a lot Sunday afternoon and I think I know why I'm unsettled. The first thing I started to think about was my downside risk, I discuss this above. The next thing I kept thinking about was what happens to me as an investor if the market never realizes that Basler is relatively cheap, where am I in five years? At first I thought no problem I could invest and let them compound my money for me at nice rates. In a few years I would own a piece of a company who's book value had increased at 15% or so for the holding period. The problem I realized is that while the company has a really nice ROE and ROIC the invested capital is mostly debt, leases and intangibles. The problem is even if I held for 5 years and ROE averaged 15% for those five years as an investor I wouldn't have anything tangible that increased. The problem is the company needs to constantly re-invest in R&D to maintain their competitive advantage. This investment is recorded as intangibles on the balance sheet, the problem is this isn't something that can be easily realized or maybe realized at all. In a sense the earnings are a product of the intangibles, but the intangibles might not have much value themselves. The R&D is a necessary expense, they can't sell off their intangibles if times get tough, the intangibles are the business. The other problem is the biggest asset is the company's leasehold improvements. I realize that there is value to these improvements yet at the same time it's not like the company could sell their facilities if they needed to. They could probably sell some equipment, but definitely not the land and buildings. And unfortunately for Basler land and buildings are re-usable and retain value whereas specialized technology for camera production does not. Looking forward in five or ten years the land and building will probably be the same value or more, the camera technology not as much. I'm willing to be ten year old camera manufacturing equipment is on eBay for pennies on the dollar. So my final conclusion was that for me to realize a return with Basler I would be relying on two things outside of my control, multiple expansion and continued earnings momentum. If earnings stay strong and continue, and the margin expands an investor would do well in Basler. The problem is if neither of these things happen my fear is an investor will find themselves a few years down the road in the exact same spot as now, invested in a company with great metrics but nothing tangible to show for it. I would love to be persuaded otherwise, leave a comment or send me an email! Price: $76 (12/13/2011) - note this is an extremely illiquid stock, small trades can really move the stock price. A bit back I did a post on investing in Timber and got some great emails from readers regarding other companies that are more pure timber plays. One of the companies mentioned was Keweenaw Land Association a smaller company traded on the pink sheets. In my last post on Queen City Investments I mentioned pink sheet stocks often having a story that follows them, Kewneenaw doesn't disappoint in this regard. Keweenaw doesn't report to the SEC but they do offer quarterly reports on their website along with their audited annual report. The company isn't "dark" by any means, they are transparent with shareholders and tout the cost savings from non reporting as an investment advantage. There are actually a few presentations on their site showing the potential cost of becoming a REIT and filing. Keweenaw has a long history, it began as a land grant after the Civil War. The company owns 159,831 acres of land of which 153,074 is timberland in the Upper Peninsula of Michigan and northern Wisconsin along with 405,985 acres of mineral rights. For much of it's history Keweenaw made money on mineral royalties and timber harvests. For years the company harvested more timber than they grew. In the 1960s the company made a decision to manage the woodland in a more sustainable manner, and began this aggressively in the early 1990s. Now the company grows more timber than they harvest and focus on increasing the asset value of the timber holdings. As I mentioned above almost no pink sheet stock escapes without having some sort of story to tell, Keweenaw is no different. The story here is a bit unique, there are two shareholders Ron Gutstein and Scott Frisoli who for the past few years have been offering shareholder proposals and director nominations at each election. The shareholder proposals seem to change each year, in the beginning there was a laundry list of suggestions to unlock value including the following, a snowmobile theme park, wind power generation, a REIT conversion, elimination of the dividend, and a buyback. The proposals haven't been for naught, the company has put together some great presentations explaining why it isn't in the best interest of shareholders to convert to a REIT. They also commenced buyback and eliminated the dividend. The dividend was eliminated with the purpose of channeling the money back into growing the business. For each letter and proposal Mr Gutstein submitted David Ayers wrote a rebuttal and posted it on the company website. Some rebuttals are quite elaborate with presentations and lots of good information, others are simply a few lines. For all this back and forth the company claims to have spent over $300,000 defending themselves. Keweenaw tries to paint Mr Gutstein and Mr Frisoli as corporate raiders who will come along and gut the company with financial engineering. Some of the shareholder proposals are a little out in left field, but others have a lot of merit. For all the defense management has put into the proxy fight they aren't exactly shining defenders of shareholder value either. Management likes to discuss how they've increased the asset value of their holdings with organic (literally and figuratively) growth. For all this growth management seems to have a plan to grow on a much later scale, this past proxy season they increased the authorized shares from 2.5m shares to 10m shares. Management has stated that they might need extra shares to raise capital and expand. The expansion would be good for themselves as they'd be able to draw a larger salary and run a bigger company but would utterly dilute current shareholders. Amazingly enough the current holders voted for this measure. Based on the current outstanding shares (1.29m) raising the full amount of capital would reduce shareholders ownership by almost 90%, a staggering number. I think management would probably be quick to dismiss a massive dilution, but their actions say otherwise. The previous amount of outstanding shares was 2.5m meaning that 1.21 shares were available to be issued which at current market prices is around $94m. For some reason management believes they need to raise more than $94m for "General corporate purposes" to grow the company, which in turn will cut current holders' stakes in half or less. Gutstein and Frisoli have been reducing their demands each year while at the same time trying to secure a board seat. I think in a situation like Keweenaw having a vocal investor is actually helpful in highlighting issues that might not be much visibility due to the non-reporting nature. Keweenaw has worked very hard to help investors understand how to value a sometimes complex investment, on their website they have a file called "Understanding KLA Asset Value and Operations". The company commissioned appraisals in 1998, 2000, 2003 and 2006 of the land value, and the timber value. The appraisal valued the company in two different ways. The first was on a single transaction basis, this means they looked at comparable timber sales and estimated what the company would fetch in the market if everything was sold at once. The second was a discount cash flow based on selling the timber down over a period of seven years. This method assumes that the company sells down their trees for both pulp and lumber at 06 market prices and then adds in a raw land value. There is also some discussion in the report about the value of the land if it was sold for non-timber uses in parcels, but no work is taken to peg a value for that. Obviously liquidating a company in this manner would be difficult and costly. The last item relevant to a valuation is the mineral rights. The appraisals didn't include mineral rights, but the company touches on the possible value briefly. From 1891 to 2006 Keweenaw recognized $78m dollars in mineral royalties, which translated to 2006 dollars is $552m. The company claims there are still significant copper, iron ore, and silver deposits on the land but at the time they're not economical to recover on a large scale. With regards to mineral rights, there are two companies currently interested in mining operations. One company has permits and could begin exploration soon, the other has leased the land, but there isn't any further information on them. So piecing this together, at the price the market is valuing Keweenaw at $640 per acre of standing timber. This is down from the 2006 appraised value of $836 an acre, and more in line with the 2003 assessed value of $668. I wasn't able to find any charts going back to 2003 but I did find some going back to 2006 regarding timber prices. Sawtimber prices have fallen from the $40s to the low $20s while pulp wood has remained slightly steady at just under $10 a ton. Considering current wood prices, and the composition of timber offerings I think Keweenaw is probably fairly valued on a standing timber basis. If we look at a liquidation value, or add in mineral rights they are probably slightly undervalued. The problem is they don't have any intention of liquidating so a liquidation valuation isn't appropriate. With regards to mineral rights it's yet to be seen if anything can be extracted, all of the easy minerals are gone, I think the market is correct to peg the mineral rights at or near zero. One thing worthy of a mention, the company does have earnings and cash flow that I've largely neglected in this post. The reason is that neither the market, the company, or competitors operating in this market value standing timber on the basis of cut earnings. The money earned from timbering is used for administrative expenses and reinvested in the properties. I think Keweenaw is doing a lot of the right things to manage their resources appropriately, they've worked to increase the quality of the wood, they're selling off non-core rural lots for residential use, and they're working to maximize the mineral assets. At this point I think Keweenaw is probably fairly valued, the stock price seems to be accurately reflecting a $600-$700 per acre price for the standing wood. The company would argue they're worth more due to the mineral rights, but my view is that if the mineral deposits were as rich as they say then someone would be mining already. I think the fact that mining isn't taking place at any level reinforces the claim in the appraisal that the deposits might be large, but they're extremely hard to get to at this point. I think Keweenaw could probably be best looked at as a pure play on raw timber lands with the minerals adding a bit of a potential upside in the form of a free option. If the minerals are extracted it will provide a really nice boost, but if nothing happens the company's valuation doesn't change. I really like Keweenaw and their approach to managing the forest and their properties, but I just can't get past the potential dilution. I realize that a dilution possibility exists for almost every equity investment, but Keweenaw management has stated that they intend to dilute, it's just a matter of the magnitude of the dilution. Increasing the shares 10x is a major concern, and for the time being will keep me from being a shareholder. It's worth keeping the company on the radar, and if this is an interesting investment maybe holding off until after the dilution. I'd love to hear thoughts and comments on Keweenaw. If anyone has experience in small cap pink sheet activism I'd love to hear about that as well. I've been engaged in an email conversation with a reader about some pink sheet stocks and one stock he mentioned was Queen City Investments. The stock is like most pink sheet stocks in that they aren't required to file anything with the SEC making the hunt for information frustrating but often rewarding. Pink sheet stocks have long fascinated me because it seems like a cult following will emerge around these companies. A cult following is often a cruel irony, passionate shareholders in unlisted companies are usually minority holders without many rights whereas apathetic shareholders of listed companies have a lot more rights which they work hard to neglect. A second feature of pink sheet stocks is they usually have a interesting story to go with them. Rarely have I ever dug into a stock on the pinks and not encountered some sort of storyline that is essential to understanding the investment. Oddly enough this seems limited to OTC/Pinks for some reason. I've never had to understand why some land deal to a brother-in-law's great aunt in 1978 was essential to an investment thesis for a listed company but often stories like this will manifest themselves in pink sheet stocks. I think there's a common misconception that unlisted stocks are all penny stocks. The unlisted market has everything, the typical junior miner penny stocks and on the other side community banks trading for $4,000 a share. The downside is that for most unlisted stocks (unless they're temporarly part of a pump and dump) liquidity is limited or even non-existant. Queen City Investments falls into the limited to impossible camp when it comes to liquidity. As far as I can tell the last time Queen City traded was on November 1st with 10 shares. One unlisted stock with a cult following and quite a back story is JG Boswell. Boswell has been written up extensively from an investment point of view by Jon Heller over at Cheap Stocks. If you're interested in understanding the history of the company and some history of California there's the 400pg book "The King of California" that dives into the nitty gritty details of the companies back story. The book is great, the characters are colorful and entertaining, if you're interested in water rights, Central Cali, or Boswell I'd highly recommend it. Like most pinks Boswell's investment thesis rests on a complex story which in part has roots in water rights granted in the 1930s. Queen City Investments is a parent company to three different companies, a trust company, a California cattle ranch, and some commercial real estate holdings in California. The appeal to the company is that it's asset rich, loaded with cash, securities, and land that's potentially undervalued. What's nice about Queen City is that they aren't only a pile of assets they also have earnings from the trust management company. Queen City was spun off from the Farmers and Merchants bank a number of years ago, the company is closely held by the Walker family. There really isn't much to talk about in terms of the business operation because it's almost impossible to find information on the business. The annual report I was able to dig up contained a few terse statements about the three holdings and not much else. The best information I could find about the company was actually on the yahoo message boards. Some posters have details on the cattle ranch which is approximately 25,000 acres, and some of the specific commercial holdings in LA. All this leads to the question, how does one find information on these unlisted stocks? For Queen City Investments I was able to dig up the 2010 annual report and proxy with some creative Googling. Some unlisted stocks freely publish their financial reports on their website. Personally I'd prefer investing in a company where I can easily find quarterly, or at least twice a year statements including an annual report. I have the links to the Queen City reports below under Resources. So a buyer at current prices can get the land and cash at book, and a trust that manages $2b in assets for 4.17x earnings or 4.65x cash flow, quite attractive! A second way to look at this is building off the land value and working backwards. From my searching I was able to find California ranch land selling in the $1500 an acre range. Even if the commercial property and trust is hard to value exactly looking from the land perspective it's pretty clear this stock is undervalued. This is the type of investment a value investor dreams of, tangible assets selling for nothing. Of course with something like this there has to be a catch right? Most investments that look this appealing on a listed exchange have some big hairy problem, usually not so for unlisted stocks. There are two big problems stocks like this, the first is it's nearly impossible to buy shares, any quantity. The company is closely held and current investors just aren't selling. If we wanted to presume that a 10% position would allow someone influence enough to realize value building the position ($4.7m) would literally take years of buying 100% of every share offered in the market. The second problem is closely related to the first in that this is a closely held company. The Walker family has run Farmers and Merchants Trust and their associated companies for generations, they apparently like the comfort of being overcapitalized and it's unlikely they will suddenly have a change of heart. Buying into Queen City Investments thinking that Mr Market will wake up and revalue suddenly is foolish, shares like this can and do stay cheap for years or even decades. Value is often unlocked by corporate actions, a merger, or a buyout and often the controlling family is in no hurry to take action, instead they're content to plod along and collect dividends. In the end Queen City is fascinating to look at, and a great example of the price of transparency and liquidity. I don't own any shares or plan to buy any, but I'd love to hear from shareholders, or anyone who has more details on Queen City. Disclosure: No position. If you click buy the book mentioned above I will receive a small commission from Amazon.com. The price through the link is no different than if you visited on your own.